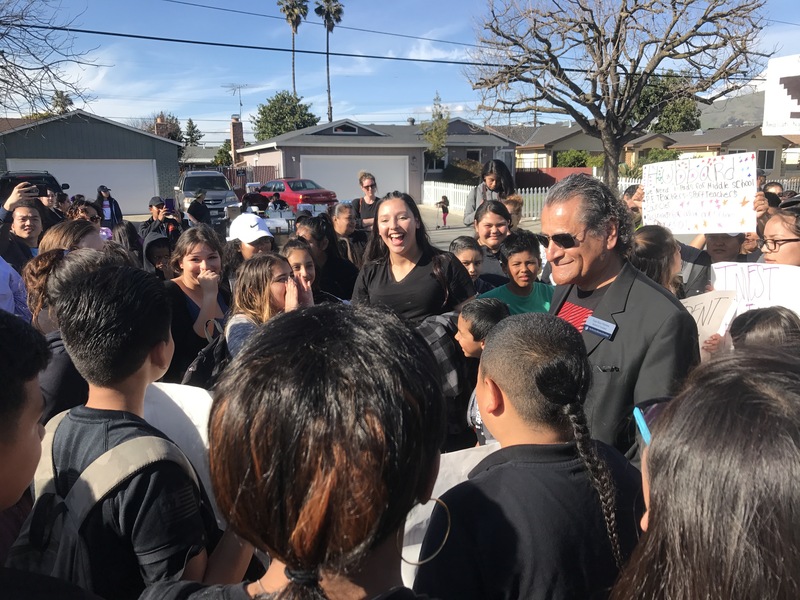 SAN JOSE, Calif. (CN) – San Jose-area elementary and middle school children left their classrooms on Thursday afternoon to protest what they say is a culture of widespread malfeasance among the local school board. 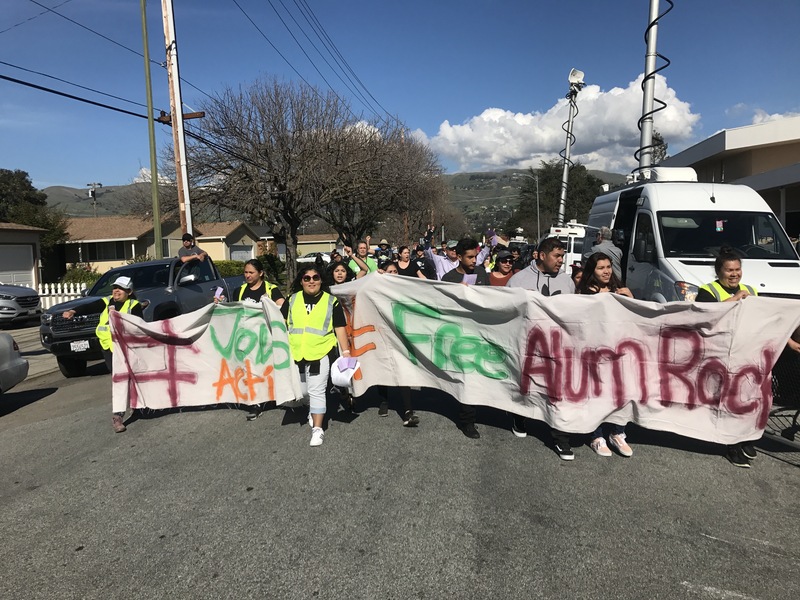 A significant share of Alum Rock Union School District students walked out of their classes in East San Jose as parents in the predominantly Hispanic neighborhood claims the school district is misusing funds for their personal benefit. “We want classrooms, we want books, we want the money Del Terra took,” the parents chanted as they marched down White Road in San Jose. The community’s issues with their school district date back to November 2016, when Superintendent Jon Gundry received an anonymous tip regarding a suspicious $335,000 contract between the district and a company called Del Terra Real Estate Services. “They billed for construction projects that never happened,” said Zelica Rodriguez-Deams, a part of a community organization based in San Jose. Soon after Gundry went public with his concerns about the nature of the contract, he was let go by the school board, setting off a spate of criticism that has only intensified with each passing month. Three school board members in particular — Esau Herrera, Dolores Marquez and Khanh Tran — have elicited ire from community groups concerned about misuse of public funds amid deteriorating school conditions at the school. Herrera was surrounded by a group of students shouting “Resign,” hours before a contentious school board meeting took place at the district headquarters. “Allegations of fraud are completely false,” Herrera said after the impromptu protest. Herrera pointed to investigations conducted by several state agencies launched late last year, which are still pending, as proof no misdeeds occurred. “They have been looking into our operations for some months and found no evidence of fraud,” Herrera said. The rest of the community seems less convinced. After Gundry was let go, San Jose Mayor Sam Liccardo was highly critical of the school district, saying the firing was likely an attempt to cover up a misuse of public funds. He attended the rally by parents and students on Thursday as well. “We need to take down this kind of corruption,” he said to cheers. Liccardo also expressed widespread concern that the board was attempting to terminate the contract of their current superintendent Hilaria Bauer in closed sessions. “A vote to terminate the contract of whistleblowers is a vote to institutionalize corruption,” Liccardo said. Rodriguez-Deams said Bauer has been subjected to seven different evaluations by the board in the course of her one-year tenure. Separately, the Santa Clara County Office of Education conducted an investigation and found potential conflicts of interest, a lack of internal controls and a fiscal situation ripe for fraud, although it did not accuse any individual board members of perpetrating fraud. It did, however, recommend the California Office of Education revoke the school district’s “fiscally independent” status — an highly unusual step for the state to take. The Santa Clara District Attorney’s Office has also announced an investigation. In the meantime, the board has resisted oversight measures, voted down facilities assessment studies that would have looked closely at how the district is spending capital and maintenance funds and refused to end its business relationship with Del Terra. The board also let go of its legal counsel and hired Maribel Medina, who parents say was ousted from a school district in Southern California for malfeasance related to Del Terra. “Our schools have bad water, bad plumbing, no heating, no air-conditions and we are spending all of this money for nothing,” said Jaime Martinez, a parent of two elementary-aged school children. Some of the children too, found their voice at the rally before the meeting. “Our school board members, who are supposed to be leaders, have been screwing us over for too long,” said Adelita Ozuna, an eighth grader at the local middle school.